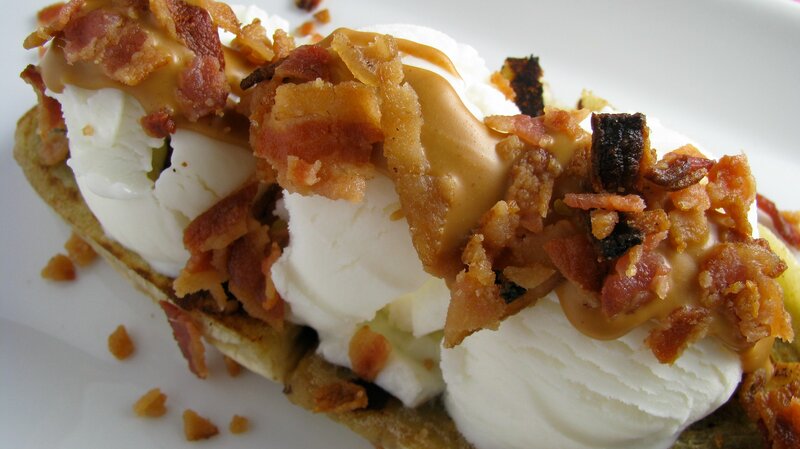 The Elvis Banana Split: Caramelized Banana, Peanut Butter and Bacon. Electrolux #splits: The Elvis Banana Split. A wild banana split with caramelized bananas, peanut butter drizzle and crispy bacon. So what makes up the Elvis banana split? Caramelized bananas are the first layer. I simply sliced a banana and caramelized it in a non-stick pan on medium-high heat. I topped it with 3 scoops of vanilla bean ice cream, a good 1/4 cup of melted, creamy peanut butter, and 2 slices of crumbled bacon. I am posting this fantabulous banana split for a great cause. To help spread the word and raise funds for ovarian cancer research, Foodbuzz is sponsoring a blogging challenge that revolves around banana splits. Foodbuzz will also donate $50 for every banana split posted by a Featured Blogger. You can help too! To help raise money, check out the Kelly Confidential website. You can make your own banana split! I know I don’t participate in things like this very often, mostly because I am a rebel without a cause and don’t like being told what to do or what to cook. However, 1.) it is for an excellent cause, and 2.) my knees went weak at the thought of a bacon banana split. Can you handle the Elvis banana split? You got your fruit, dairy, healthy PB fat and bacon protein… what’s not to love?? I love your life :) really, I don’t think life could get any better than eating ice cream and bacon together. I just gained 5lbs thinking about it. I was hoping you could help me with something really quick–I made the sweet and sour chicken the other night (it was AWESOME! ), but it turned out mostly sweet–no hint of sour, really. I was wondering if you had a thought on what might not have gone right? My oven runs hot, so maybe I overcooked the vinegar right out? Hoping you might have a tip. I’m new around here and I. LOVE. YOUR. BLOG!! Hi Devon! So glad you stopped by – thanks! 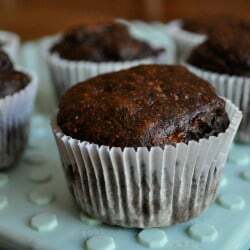 Did you do any other variations on the recipe? Did you measure the ingredients or eyeball them? It is not my original, but I have always made it exactly as posted. Maybe try lowering the heat in your oven a bit? Keep me posted. Can I handle it?! Who u talkin to? OF COURSE. Looks ridiculously delish. The bacon is interesting though…not sure about it, but since everything you say is pretty much the food bible to me, I totally trust ya! Is it weird that I think the best part of it is the vanilla ice cream? Holy crap! That looks amazing!!! Oh, I can handle it! E-Yum! Salty and sweet, luv it! Great banana split creation and name for it…all for a worthy and important cause. How do you think of these things?! Everything looks great! This is so insanely genius. I have tried a bacon + PB combination before and it was Heaven. I can only imagine how it would taste with the cold vanilla ice cream and the warm caramelized banana! oh dear lord that looks amazing!!!! Wow that looks deliciously yummy!!! I want this right now! ummm, yeah, this NEEDS to be entered into the contest. You’ve combined all of my favorite foods, into one orgasmic desert. My mom grew up in Wilmington, Ohio. Birthplace of the bananas split. How about that?! You’ve got me beat!!! This looks amazing. Mine did not turn out as well as I wanted. OH well, was still fun :) Yours though…yowza!!! This is beautiful Jessica! ALmost to pretty to eat. LOVE it!! I ran out of time to post a banana spilt (unfortunately), but I’m sure mine wouldn’t have been nearly as creative as yours! The desert looks so good and your photography is excellent..makes everything look like it’s 3 dim. Um, wow. Thats all I have to say. I’m making mini cupcakes for a baby shower and I want them to be super tasty, cute, and amazing. Which one of yours or even another recipe would you suggest? It’s for a boy baby shower also. Wowzers! This deserves an award. elvis is rolling in his grave right now. this would make any king proud!! <3 good job! my oh my – looks great! Haha, you so went there and I love it! I think you officially win the contest. You are amazing Jessica! Someone had to add bacon and I’m glad it was you! I will just take the carmelized bananas for myself! I think this is one of those times where the bacon is absolutely necessary. This banana split sounds amazing! That may be the best banana split I’ve ever seen in my entire life. Ohhhh my god. Ohhhhhh. m. g.